The Legislature has passed the final version of Senate Bill 119, the FY15 Capital Budget. In addition to the $76,697,591 worth of projects in my district that were approved by the Senate, the House included an additional $2,153,000 worth of projects for Senate District Q for a total of $78,850,591. The specific projects added by the House are listed below. The projects that were approved by the Senate were listed in my previous newsletter and can be seen by following this link – Senate Capital Budget. The personal bills I introduced during the 28th Legislature which have passed are: Senate Bill 159 regarding the AirCare Membership Program; Senate Bill 201 regarding criminal trespass; and Senate Concurrent Resolution 2 urging the acquisition of Tongass National Forest Land. Senate Bill 159 is a bill that will allow Airlift Northwest to continue offering the AirCare membership program for medevac services. It passed in both the Senate and the House of Representatives unanimously and was signed into law by Governor Parnell on April 23rd in Juneau. Since January 2009, Airlift Northwest, the provider of lifesaving air medical transport services, has offered the popular AirCare membership program to residents of Southeast Alaska. Over 3,000 Southeast residents are enrolled in the program which covers the cost of any out-of-pocket expenses related to Airlift Northwest’s medevac services. Air medical transportation is expensive and insurance may not cover all the costs. The AirCare program directly helps fund Airlift Northwest so they can transport critically ill or injured patients to hospitals with levels of care not locally available. Since its inception, the AirCare program was offered to Alaskans under a regulatory exemption it received from the Alaska Division of Insurance. However, after an organizational restructuring, the Division of Insurance deemed the program no longer exempt and ordered Airlift Northwest to cease enrolling new members. Airlift Northwest was told they could honor their existing memberships but were not allowed to renew expired memberships or accept new members. Senate Bill 159 will exempt air ambulance services from the state’s insurance code, thereby allowing Airlift Northwest to continue offering the AirCare program to Alaskans. Reducing the burden and expense to the private property owner of signage requirements and closing a loophole to trespassers are among the reasons I introduced this bill. Now that the bill has passed, Alaska Statute 11.46.350(c) will be repealed, thereby removing the excessive requirements for posting numerous no trespassing signs in order to protect access to private property. Without this repeal, intentional trespassers will continue to use this section of statute as a legal defense to enter and remain on private land. All they have to do is find an access point that isn’t posted. Senate Concurrent Resolution 2 also passed the Legislature on April 18th and is waiting to be transmitted to the Governor. This resolution urges the United States Congress to act on a request of the governor to acquire additional state land in the Tongass National Forest from the United States government by purchase or negotiation or by seeking amendment to the Alaska Statehood Act. The idea behind this proposal is for the state to acquire forested land in the Tongass National Forest by whatever means necessary. Approximately 5,500,000 acres of land entitlement granted to the State of Alaska at statehood have not yet been conveyed. The people in Southeast Alaska should have the ability to expand their communities and be self-sustaining and we can’t do that unless we have access to land in the Tongass. The closure of two pulp mills affected roughly 30 percent of the economic base south of Juneau and it is my desire to see the state resume control over more of our available resources. I was very pleased to see that the State is stepping up to help Southeast in economic stabilization and expansion through the following financial programs this session. On the final day of the extended legislative session, the Alaska State Legislature passed Senate Bill 99 which includes three provisions of significant importance to the economy of Southeast Alaska. It authorizes the state to provide financing for the Blue Lake Hydroelectric Project in Sitka as well as two mining projects on Prince of Wales Island – the Bokan-Dotson Ridge mine and the Niblack mine. All three of these provisions were inserted as amendments to Senate Bill 99 which was originally introduced as a bill making technical changes to the Sustainable Energy Transmission and Supply Fund within the Alaska Industrial Development and Export Authority (AIDEA). 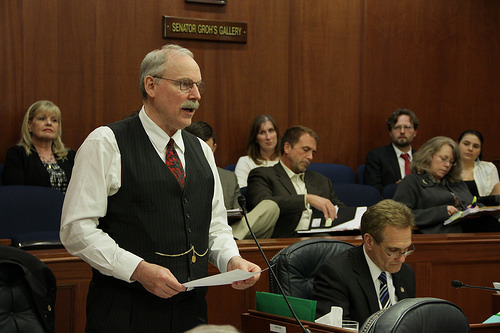 Moments before Senate Bill 99 passed the House, an amendment was inserted without objection for the Blue Lake Hydroelectric Project authorizing the Alaska Energy Authority to approve up to $18,600,000 in loans from the power project fund to the City and Borough of Sitka for the financing of this project. 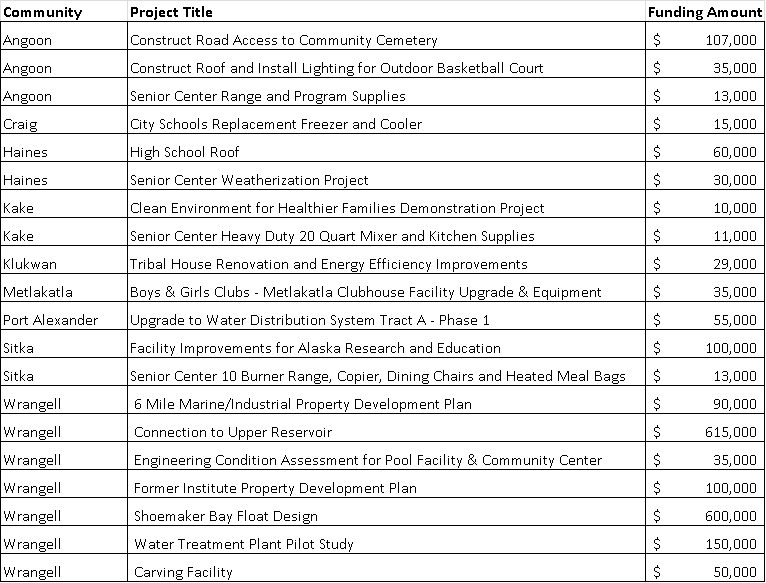 It will give the City and Borough of Sitka more options to access low interest loans needed to complete construction with the least amount of burden on the utility rates paid by the residents and businesses in Sitka. I proposed the two amendments for the mining projects when Senate Bill 99 was in the Senate Labor and Commerce Committee. The amendment for the Bokan-Dotson Ridge mine allows AIDEA to issue up to $145,000,000 in bonds to finance the surface infrastructure of this rare earth element project located on Prince of Wales Island. This project represents an unsurpassed opportunity for Alaska to furnish materials of critical importance to the United States military and green energy technology. Additionally, this project is important for the much needed jobs it will create in Southeast Alaska. During the estimated one and a half years of construction, the onsite workforce will peak at about 300 employees. During operations there will be about 190 employees. The amendment for the Niblack mine project allows AIDEA to issue up to $125,000,000 in bonds to finance the Gravina Island Industrial Complex near Ketchikan for an ore processing facility. Niblack is a gold, copper, zinc, and silver deposit located on Prince of Wales Island. During mine operations, Niblack has the potential to provide 200 full-time jobs, with about two-thirds of workers at the mine site and one-third at the processing facility. Over the past 20 years, Southeast Alaska’s economy has shrunk about 30-percent due to the loss of our timber industry. This has set off a ripple effect in our communities, hurting everything from schools to local businesses. These two mining projects offer a very large employment opportunity for Southeast Alaska and will expand our economy beyond fishing, tourism and government, to include mining. This state assistance through the issuance of AIDEA bonds replicates a financing structure that has already proven to work with other mining projects like the Red Dog Mine. Another bill that I was pleased to see pass before the Legislature adjourned and which I cosponsored was Senate Bill 71 regarding the payment of fisheries resource landing tax. That bill passed on the 90th day of the session and includes an amendment extending the product development tax credit for salmon and herring products. The program has been in place since 2003 and without this extension, it would have expired on December 31st, 2015. This is an important incentive for the commercial salmon and herring industry and because of it we have seen increased product diversity, increased state revenues from the fisheries business tax, and increased permit prices. The tax credit applies to investment in new property that meets requirements for value-added processing of salmon and herring products. The amendment added to Senate Bill 71 extends this credit until 2020. Senate Bill 60, regarding sea otter population management was stopped in the Senate Judiciary Committee. I will continue to work on a solution to this problem during the interim and bring back a new proposal next session. Now that the 28th Legislature has finally adjourned, I am looking forward to returning home to Sitka. Besides spending a lot of quality time with my family, I plan on traveling a lot around the district this summer. There are 27 Southeast communities in my Senate District and it’s important to me that I visit as many of them as possible in the coming months. I always enjoy meeting with local leaders to discuss the needs in their individual communities and to see what’s happening first hand. It helps me do my job better and allows me to communicate more effectively with my constituents. I wish everyone a fun and safe summer and I look forward to seeing you on the water or in your town.